Merely a week after the ExCel Centre in East London had hosted the Doctor Who Festival, the show was on the road again, over 17,000 kilometres away - this time at the Hordern Pavilion and Royal Hall of Industries, in Sydney, Australia. While the numbers who rolled through the Pavilion on the weekend of 21 and 22 November probably did not rival the attendance of UK fans at the ExCel Centre the week before, you certainly could not fault the passion and the exuberance of the Aussie fans. The bulk of the attendees would have been locals from Sydney but there were many fans (this Melbourne-based writer included) who made the trek from all parts of the continent, from as far away as Cairns (a good 2500km north) to as far west as Perth (a mere 4000km away) and as deep south as Tasmania to see the Doctor Who circus roll into old Sydney town. It really was as much an Australian event as it was a Sydney-based one, illustrating just how universally loved Doctor Who is in this former colonial outpost. Australians and the ABC, the Australian public broadcaster, have traditionally been great supporters of Doctor Who over its 52 years, and the series has never been more popular amongst younger and older Australian fans alike. Indeed, whether it was deliberately planned or otherwise, the timing of the Australian Doctor Who Festival could not have been better - 2015 is, after all, the 50th anniversary of Doctor Who first airing in Australia. Indeed, BBC Worldwide should be commended for going all out in its organisation of this event and not taking Doctor Who's Australian fan base for granted. Not only did we get an impressive line-up of guests, spearheaded by the current Doctor Peter Capaldi (Capaldi is the first incumbent in three decades to visit Australia in an authorised capacity; before that, you'd have to go way back to the early 1980s when Peter Davison did a promotional tour), but BBC Worldwide spoiled us even more by putting on display costumes and props from the just completed latest season of the program, including a Mire trooper's armour (The Girl Who Died), the towering Fisher King (Before the Flood), the Sandman King (Sleep No More) and a Zygon (The Zygon Invasion/Inversion). There was even a miniature of the Dalek city on Skaro (as seen in series opener The Magician's Apprentice/The Witch's Familiar). This well and truly exceeded my expectations; while I expected to see props and costumes on display, I was expecting them to be from years well past. In addition to Capaldi, the guests for the weekend also included executive producer Steven Moffat, series writer Mark Gatiss, Ingrid Oliver (Osgood), who stepped in at the last minute when Billie Piper pulled out due to filming commitments, and Seventh Doctor Sylvester McCoy. Dan Starkey (Strax) and monster artiste Jon Davey (who has played Daleks and Cybermen in the modern TV series) also participated in live shows in which they demonstrated to fans what it was like to walk like a Sontaran or to operate a Dalek. Another highlight of the weekend was the visual effects show hosted by Danny Hargreaves and his Real SFX team in which he wowed the audience by triggering charges on a Dalek and a Cyberman on stage and discussed the challenges of working in pyrotechnics (including setting up the charges that unveiled the impressive "NO MORE" banner blasted by the War Doctor in The Day of the Doctor). Fans also had the opportunity to line up for photos at the Real SFX team's booth with a Dalek, a Christmas tree and polystyrene snow! In addition, there were various other panels occurring contemporaneously within the Festival hall, eg The Science of Doctor Who (which has previously toured Australia), the writers' masterclass (with Mark Gatiss), the Production Village (with questions answered by series director Daniel Nettheim) and the Doctor Who Pub Quiz. The Q&A sessions with Hargreaves, McCoy and Capaldi, Oliver and Moffat in the main theatre were hosted and moderated by local ABC radio identity Adam Spencer. Sylvester McCoy, as always, proved to be the consummate entertainer, preferring to get up close and personal with the fans rather than staying still on the couch on-stage. Sylvester is no stranger to the Doctor Who convention circuit in Australasia; he's been here numerous times since the mid-2000s, including filming in New Zealand for The Hobbit film trilogy, and while he often regales us with some very familiar stories (eg the female artiste in 1989's Survival who stripped herself naked from her Cheetah Person costume after overheating and was last seen running up some sand dunes in a thong! ), he nevertheless knows how to keep an audience entertained. He also remains ever so spritely, despite being in his seventies and hobbling around with a cane (thanks to, as he put it, so many "comedy injuries" sustained during his time as a stuntman and performer on the Ken Campbell Roadshow). 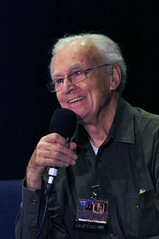 McCoy had fans rolling around in the aisles with his Sean Connery impersonation when discussing why David Tennant chose not to use his Scottish accent during his tenure as the Tenth Doctor. 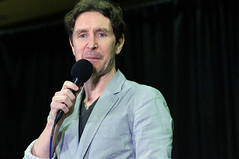 He also amused everyone with his recollection of the regeneration scene in the 1996 TV movie; he described himself and Paul McGann as having "rubber faces" and proceeded to pull all manner of strange expressions when explaining that he and McGann had to screw up their features for the CGI team to complete the regeneration effect. He also clearly enjoyed ribbing his predecessors and successors, eg describing Colin Baker as having a "great costume" and McGann as a "rather ugly Liverpudlian". While Sylvester was as comedic as ever, the real stars (at least as far as the fans were concerned) were Peter Capaldi and Ingrid Oliver who spent the bulk of the weekend patiently and industriously meeting, greeting and posing with fans for a succession of photos. It is all too easy to just herd fans through, snap their photos and usher them on (as often happens at fan-run conventions). It is to BBC Worldwide's credit that as much effort as possible was made to personalise the experience for fans by having the minders introduce each and every person by name to Capaldi or Oliver who would then acknowledge them. The actors were also quite happy to do fun poses with the fans, including Capaldi's (now) signature finger pointing as the Doctor. Capaldi further got brownie points with the Aussie audience for saying that he didn't truly realise the extent of what it was like to be the Doctor until he saw Australian fans "en masse" at the Sydney Opera House during the World Tour. At that time, he had just finished making his first series but it had not gone out and so he did not know what the reaction would be to his performance. Similarly, he recalled feeling a little left out during the 50th anniversary celebrations in November 2013; he had been announced as the new Doctor at that point but was not invited to participate in the celebrations with his predecessors. This led Moffat to jokingly tease Capaldi for just being the classic grumpy Glaswegian! t didn't take long though for Moffat to do a little grizzling himself when Spencer asked him how the touring party had coped with the heat wave the day before, as Sydney's mercury exceeded 40 degrees Celsius (or 108 degrees Fahrenheit, which Sylvester McCoy said sounded more impressive!). Moffat remarked that the heat, coupled with the northerly winds, made him feel like he was being assaulted by a giant hair dryer! He was also astounded to see Australian business people wearing suits in the heat. "Why aren't you dying? " he quipped. Ingrid Oliver was not as unfamiliar with Australian conditions, having previously toured in a sketch show based on her BBC2 comedy series Watson & Oliver (with fellow comedienne Lorna Watson). Oliver stated that she knew she was truly in a Doctor Who episode (2013's The Day of the Doctor) when she was required to put on her "best Doctor Who acting" - at the moment Osgood realises that the Zygons are hiding under shrouds in the Under Gallery. (Capaldi helpfully described this as "penny drops" acting, which subsequently led both actors to playfully put on their best "penny drops" expressions for the benefit of the fans.) The Day of the Doctor also proved to be something of a homecoming for Oliver, as location filming was done around the Tower of London - where her first job after drama school was to dress up in period costume to entertain American tourists! Like Capaldi, Oliver also didn't realise just how much the part of Osgood had cut through with fans until she started to meet lookalikes that were dressing as Osgood (including moderator Spencer's daughter who greeted her backstage by inhaling an asthma pump!). She also talked about just how gut-wrenching it was when she realised Osgood was to be killed off in Death in Heaven but was elated when she was invited back to reprise the role this year. Capaldi similarly expressed elation when he discussed the 12th Doctor's guitar. He recalled that he had made the suggestion to Moffat about the Doctor playing an electric guitar in passing between seasons, promptly forgot about it and was then delighted to find it had been taken up by the script writers. He then accompanied the production team to a vintage guitar shop in Soho where he chose a guitar that reminded him - "this is really for guitar geeks" - of a home-made version of a Fender Stratocaster. Capaldi subsequently complimented a fan in the audience who came dressed as his character, complete with Fender Stratocaster! Spencer also asked Capaldi about the publicity photo taken in September to promote the return of Doctor Who in which he, Jenna Coleman and two Daleks paid homage to the album cover for the Beatles' album Abbey Road. Capaldi stated that the photo was taken in "30 seconds, a minute tops" (because Abbey Road is open to traffic) but they practised in a nearby car park with the Daleks before doing the shot. Capaldi also recalled how excited he was to originally play Caecilius in the 2008 Doctor Who episode The Fires of Pompeii alongside his predecessor David Tennant. As he was a huge fan of the TV series and never expected to have any further involvement with Doctor Who, he was very easily tempted to accept the offer without even reading the script before his wife urged him to be "professional" about it. He invoked plenty of laughter in the audience when he joked that there was a little part of him that wanted to be the monster that could kill Tennant! When it came to eventually being offered the part of the Doctor, Capaldi stated, "There was a part of me that said I had to be realistic and consider how my life would change ... I knew that my visibility would change and I would be famous in a way that I hadn't been before. I don't think being famous is a natural condition, it's quite anxiety-making and odd. So I had to seriously think about that, even though I was prepared to take the risk ..." Interestingly, he later said that while he enjoys playing the role, he still doesn't really think of himself as a "Doctor Who", "may be when it's all over". That said, he added that while he finds the part physically exhausting, thanks to doing minor stunts and running up and down corridors, he nevertheless finds the part keeps him "healthy, spritely and spry". Capaldi was also asked about the actors that inspired him growing up. He cited John Hurt, Peter Cushing and Christopher Lee, as well as the first four "Doctor Whos", as actors that had impressed him. He recalled how he met Peter Cushing as a child and got his autograph and because the two of them shared the same initials, he styled his signature after Cushing's autograph, which he described as a "very elegant and considered signature". Moffat also recalled how John Hurt came to be cast in The Day of the Doctor. "We had this situation where we managed to accumulate two Doctors for this special and I had the idea that maybe there was one more Doctor than we knew about, the Doctor who fought during the abominable hiatus of all those years, 16 years without Doctor Who ... When I wrote the ending to the script for The Name of the Doctor, I had it written that a famous actor turns around. It had to be a famous actor, someone you would have cast back then as the Doctor. I remember saying somebody like John Hurt, whom we regarded as completely inaccessible. "We were weeks out from shooting, we were so close, I could barely stop crying and so we sent the script to John Hurt. And in an incredibly short space of time, he read it and said 'Yes', which was astonishing to us! And the question that came through via John Hurt's agent: 'John wants to know, he actually is a 'Doctor Who' now, he wants to know ..' I told him, 'It's not a trick, he is a proper 'Doctor Who''. He got the benefit, you see, he worked three weeks in Cardiff and he's an official 'Doctor Who'. " Moffat added Hurt's casting was such a huge relief, considering at one point neither Matt Smith nor David Tennant were contracted and he was faced with the possibility of writing a 50th anniversary special with just Jenna Coleman! To close, Moffat was asked his opinion of Doctor Who's expanded universe (eg the comic strips, the novels, the Big Finish audios). He said what he loved about the expanded universe was that the "past is still growing, there are still more episodes of David Tennant or William Hartnell that we never saw. It means that the future for Doctor Who extends in both directions, all of them are still alive, all of them are vibrant. You have Big Finish, the comics and the books making new stories. It feels unstoppable. It's not just growing into the future, the stuff that's supposedly over is still growing and I think that is the mark of a legend that can never end". There's no doubt events like the Doctor Who Festival further enrich the legend for fans. The Australian Festival was a well organised, memorable and fantastic event. If the exercise is repeated in future - whether that is in the UK, Australia or indeed in Doctor Who's other traditional markets such as North America - I encourage all fans to attend. While the price of entry may seem hefty (almost $AUD200), the experience is more than rewarding. This weekend the BBC organised the first Official Doctor Who Convention since the series returned to TV screens in 2005 and the biggest Doctor Who event the Corporation has run since the stately grounds of Longleat hosted the celebration of the show's twentieth birthday in April 1983. Very different to many fan run conventions, the announcement of the event had a mixed response with some fans, with some criticising the entry price and the lack of inclusion of many items that have now become a integral part of many alternative conventions. But an official BBC event is always going to be a very different beast, with different aspirations and objectives than an event purely ran by fans. Each type of event has its own own unique selling points and each will appear to different type of fan. A BBC event will always be much bigger than others purely because it is an official BBC event. Many will attend who would never dream of going to an alternative convention with the event appealing to a far wider circle of fans. So it is bound to lose some of the intimacy that many smaller conventions process. The unique advantage the BBC has is its ability to get all the stars of the current series to attend along with many of the people who actually make episodes we all know and love. The BBC event has been described as Doctor Who Confidential Live and while that may be a good way to describe it it should not be taken as a negative. Where else could you get the three main stars onto a sofa and see them discuss their feelings for the show alongside the main writer? Where else could you get a chance to see the man behind all the Special Effects in the series since 2005 recreate some of the explosions and bangs and blasts we all know and love? Where else could you seen Silurian Masks being created before your eyes and get a step by step description of the restoration of a Classic episode by the guys who actually do this for a living. The main reason for many attending the convention was the chance it gives you to see the current stars of the show in the flesh, and the convention didn't disappoint. The Meet the stars panel comprised of Executive Producers Caroline Skinner and Steven Moffat, alongside the current TARDIS team of Matt Smith, Karen Gillan and Arthur Darvill, all greeted with tumultuous applause. The affection and warmth shared between the team shone through and kept the audience entertained with tales from the set. Matt Smith is a true star and gave several fans memories they will treasure forever, including one fan who was treated to a hug not only from the Doctor, but the entire TARDIS team , and the young Eleventh Doctor look-a-likes who were treated to their very own Jammy Dodger from their doppelgänger on the stage. Questions from the audience covered many topics with the team remaining tight lipped about what might be coming up in the future. Ask me something I can answer Moffat pleaded at one point. The Second Panel of the Day took a look at the making of an episode that was actually filmed inside the Millennium Centre. The Girl Who Waited used several locations around the building and writer Tom MacRae discussed the way he concieved the episode and his annoyance that the Handbots had not yet been made into a toy. He was joined onstage by producer Marcus Wilson who gave an insight into the problems in making the episode and Millennium FX Director Neill Gorton who explained how the ageing of Amy was achieved. The final panel took a look at the evolution of an entire series with Caroline Skinner returning to the stage to talk about how a series is devised. Expertly chaired by Barnaby Edwards, Skinner was joined by Casting Director Andy Pryor, Production Designer Michael Pickwoad, Director of The Rebel Flesh, Julian Simpson and Director of Photography Stephan Pehrsson who took time to explain their own contribution to the series. Before the Panel ended an audible gasp when around the theatre when a special preview of Series Seven was shown. The costume display featured many items recently seen at the Doctor Who Experience in London. 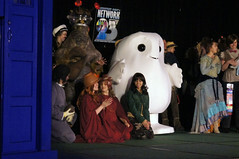 Several Doctor and Companion Costumes were on display along with monsters from both the current and classic series. A cabinet was filled with Sonic Screwdrivers and TARDIS keys from throughout the years. Danny Hargreaves is the man responsible for all the Special Effects on Doctor Who, and has been since the series returned in 2005. His session was a treat for all concerned, getting off to an explosive start when, halfway through the introduction, the entire west wall of the theatre appeared to explode as a Dalek glided across the stage. Hargreaves demonstrated many of the devices used in the show, explaining how bullets appear to explode on impact and how snow is made before allowing one young fan to play at being the Doctor and to destroy a Cyberman. Millennium FX were based in the main lobby where attendees were treated to live demonstrations of the techniques used in making some of the monsters and villains seen on the show. The displays alternated with the Doctor Who restoration team explaining some of the painstaking work that goes into restoring classic episodes for DVD release. Away from the main hall several guests from the recent series of Doctor Who were available for autographs including Simon Fisher Becker and Mark Sheppard. It's a pity more could not have been made of these guests as I know how entertaining both can be and what a valuable contribution they could have made to any panel. The Convention was clearly a success with BBC Worldwide selling all 3000 tickets in advance of the event. Although not confirmed, plans are in place for more events in the months leading up to the shows 50th Anniversary. Most who attended found the event a unique, exciting chance to see behind the scenes, and to meet the stars of a series they love so much. One of the most wondrous things about being a Doctor Who fan who grew up with the classic series is to see the shear joy and delight on children faces as the magic of the current series bewitches them just as it has done for their predecessors over many years. Gallifrey One is one of North Americas longest running conventions, now in its 23rd year. This years event was the biggest ever with 3,183 attendees, that's up from 2186 last year and 1595 the year before. The event is a must for Doctor Who fans, boasting some tremendous guests, some great conversations and a chance to totally immerse yourself in the world of your favorite TV programme for a whole weekend. After 23 years the event has a lot of regular attendees, and in other hands may have become a trifle cliquey. Not so with Gallifrey One where all are made to feel incredibly welcome, whether attending for the first or the twenty first time. The convention hall is packed choc-a-block with attendees, many dressed as their favorite character from the series. It can be a bit over-whelming, especially to an inhibited Brit, to see the effort and enthusiasm that attendees put into the making of their costumes. But the quality of some of the costumes is incredible. Just a short walk through the lobby reveals life sized Daleks, a replica K-9, several hundred Doctors of all incarnations, and even a massive Adipose. There were panels on a wide variety of issues, from chats with new series Directors, to discussions on Why we Collect Action Figures?. Most moving were the talks on Nicholas Courtney and Elisabeth Sladen from Lucy Chase Williams and Amy Krell, two people who were deeply involved with the two stars and who shared some of their most personal memories with the convention. For those who wanted to spend, there was a well stocked Dealers room, and for those who just wanted to watch there favorite programme, two screening rooms showed a continuous stream of episodes from both the classic and the new series. A further room showed off the TARDIS console from the TV Movie, freshly restored and spruced up ready for the convention. A convention lives or dies by the quality of its interviews, and Gallifrey One had some tremendous guests who provided some very entertaining panels. Friday was mainly dedicated to single guest interviews, while Saturday and Sunday saw guests grouped together in various combinations. It was a delight to see the cast of the 1996 TV Movie reunited. Producer Philip Segal told how Paul McGann turned the role down several times before eventually being persuaded to join the cast. 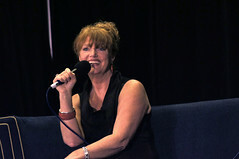 McGann said he only really realized the enormity of what he had taken on when his agent, Janet Fielding, was collared by a fan during the first day of filming in Vancouver. Also appearing were Daphne Ashbrook and Yee Jee Tso. The only gremlin of the weekend was when Eric Roberts, who played The Master in the Movie, went AWOL for the panel. Question of the weekend came from the audience member who asked if he was absent as he was to busy 'dressing for the occasion'. Other panels included Life with Doctor Who, where members of the cast of the revived series shared some of their feelings on how working on Doctor Who has affected their lives. Camille Coduri told how she was approached in the street by a man asking her to slap him, Caitlin Blackwood told of how her teacher has asked her to autograph a figure of Amelia Pond, and Simon Fisher-Becker told of how he turned up for his audition totally dressed in blue. Highlight of the weekend though must surely be the Saturday Panel looking back at Doctor Who in the Sixties. William Russell, Maureen O'Brien and Waris Hussein held the audience spellbound with their tales of Doctor Who in its earliest days from three people who were actually there. Excellently moderated by Gary Russell the memories were crystal clear as they told of the struggles to get the series made against a climate of hostility from many in positions of power in the BBC. Hussein paid tribute to Doctor Who creator, Sydney Newman, saying he deserved a credit on every episode. They told of life working with William Hartnell, of how he had to be persuaded against his better judgement to take the role. Maureen O'Brien told of how her job had been to shake Hartnell out of his moods and to make him laugh. Sunday featured a three screenings where guests were asked to do a live commentary on one of their episodes. The highlight was Richard Senior talking about Let's Kill Hitler. His enthusiastic comments and delight in the show shone through making a very entertaining 45 minutes. By contract the commentary on the TV Movie was rather muted, with the guests getting rather to much caught up watching the show they hadn't seen for several years, than talking about it. Friday evening guests were treated to a double bill of Louise Jameson. First up was a short 15 minute film. Cleaning Up by the Guerrier Brother is a short thriller staring Jameson along with Mark Gatiss, which was received very warmly by the audience. The lady herself then appeared in person in her one woman play Pulling Faces, written by Helen Goldwyn and directed by Nigel Fairs. Jameson's performance was a tour de force as she inhabited the characters in the world of Joanne Taylor, an actress who has reached the age were she needs to seriously consider a face lift. Based on events in Jameson's life, the play is funny, entertaining and deeply moving telling the story of how life's priorities change with experience. Each character is real and well defined and perfectly realized by Jameson who got a tremendous reaction from the performance. Perhaps the fact the play was being performed just a few miles from plastic surgery central in Beverly Hills helped define the issues even more. Saturday night the entertainment was provided in the form of the Masquerade, where sketches and presentations based on the show are showcased. Daphne Ashbrook performed three songs from her new album and Comedian Charlie Ross gave a new take on The Sound of Music. Overall it is a tremendous weekend which also raised over $7000 for the Students Run LA charity. Next year promises to be even bigger and better as the convention celebrates the show's 50th Anniversary. Be there if you possibly can.